Discover, Explore, and Celebrate at ECHO! 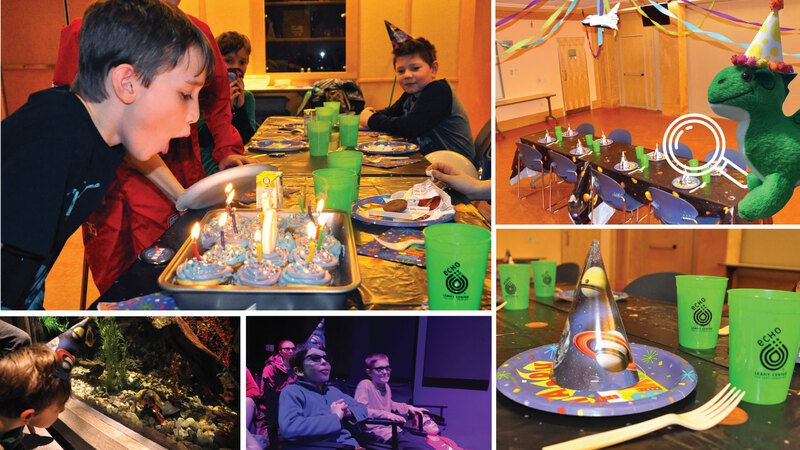 Celebrate in eco-friendly style while supporting ECHO’s mission to inspire families in the joy of scientific discovery and wonder of nature. Your guests will enjoy an unforgettable party and have 100% access to ECHO’s many exhibits including 70 species of animals and more than 100 interactive, hands-on exhibits. For more information, or to book a party, please contact Keely O’Brien, Event Coordinator, at kobrien@echovermont.org or 802.864.1848 Ext. 124. Food and drink must be consumed in the party room provided. Please note that due to our building’s fire-safety detectors, helium balloons are not allowed. Feel free to include regular balloons in your celebration. We recommend non-latex, eco-friendly designs. "I just wanted to let you know that Noah’s birthday party at ECHO was the BEST BIRTHDAY EVER! I couldn’t believe the beautiful view from the room and how nicely everything was set up. The story time at 10:30 was perfect timing for the kids to group and get together. The staff at the front desk were very courteous and handled everything perfectly. Thanks again!"